Effluence from a Technology Illness. You must update Win10 to the latest version before you will be able to enable the Windows Subsystem for Linux and Ubuntu (which is where you will find bash). It is best to do this over a wired connection as it will go faster and more smoothly. The final piece of this puzzle is the (optional but pleasant enough) Code (free) version of Visual Studio. You can get that for Windows, Mac, and Linux directly from this site. A user wrote in because they button they were using to show the Desktop was no longer present. We all had a good laugh when we saw their attached image. The problem was were all laughing for the wrong reason. 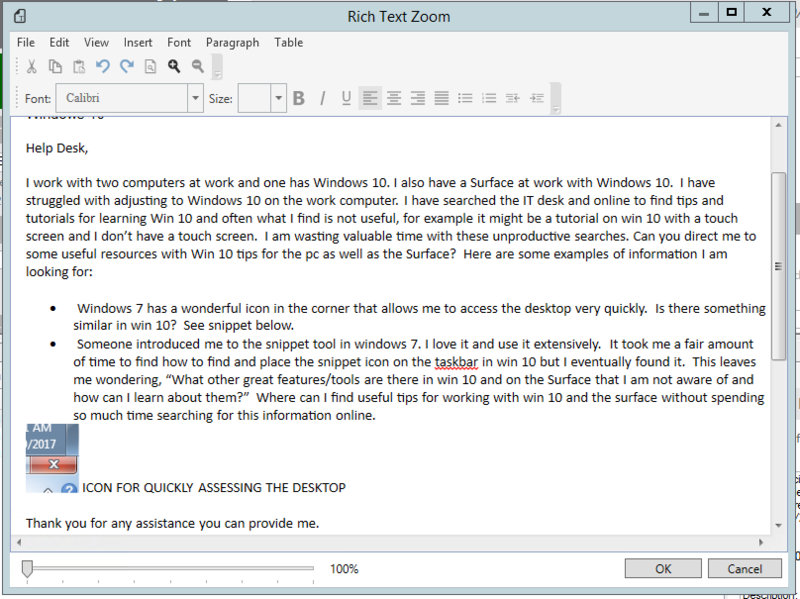 They were not in fact using the close button on a window to show the Desktop as the above may suggest. No. 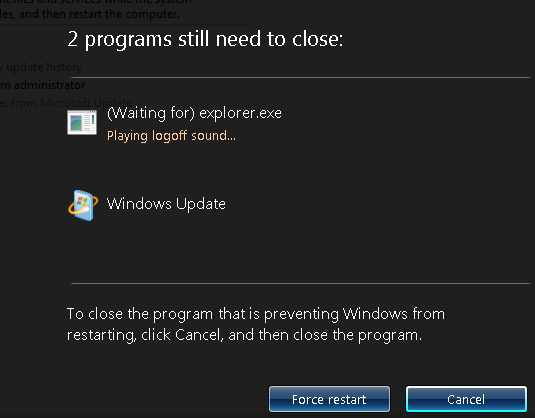 They were actually using the Show Desktop button at the far end of the Taskbar. We should have been laughing at the oddness of the image. In reality it is important to understand what the other is saying. This will ensure that you are laughing for all the right reasons. Is Your Logoff Sound The Ring? It was a remote system so it’s difficult to imagine what was happening over at that end but playing the logoff sound doesn’t usually take so long. 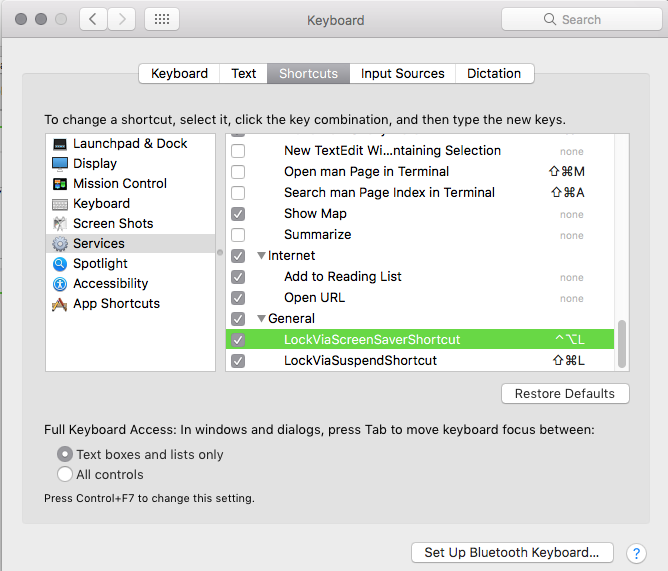 The following is a method for creating a keyboard shortcut on a Mac such that the shortcut will lock the screen. 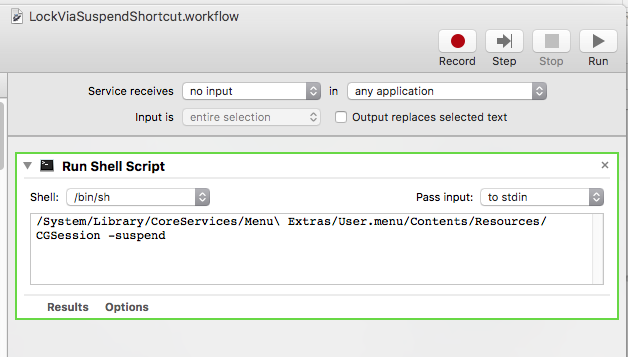 This method involves using the Mac’s Automator and a bit of shell script. It is also important to set certain settings. We are going to show two different shortcut options. They can be run in parallel if desired. They also may be modified within reason and remain equally effective. The shell script puts the system directly into the suspended state. Suspending the system (via script) is slower but requires no additional settings. Launching the screen saver does just that. 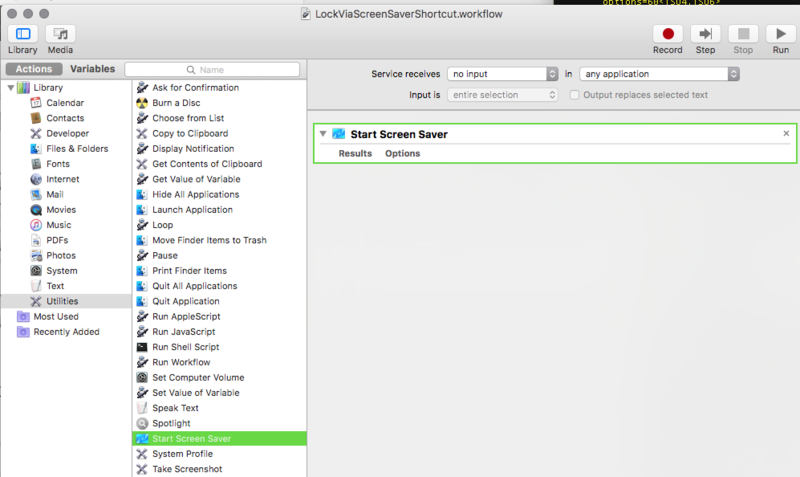 Launching the screen saver requires certain screen saver settings (below) and is faster. Note the “no input” and the “any application” settings in both drop-downs for both methods below. Once you have created these automations, you will only need to assign a shortcut for each. Since you have used clear names per the above, you will have no difficulty identifying which automation is which. The field to the right of the name of the automation holds the key combination. Choose what you’d like and choose wisely. The mouse may need to be out of a VM in order for the shortcuts to be captured by the Mac. These fives seconds will give you a small buffer to keep your screen from locking if you are reading an article and it goes blank. 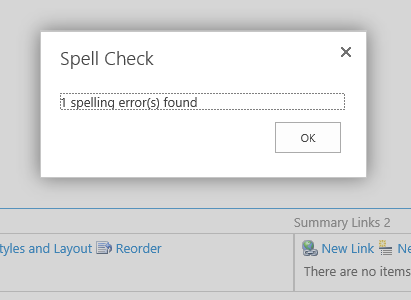 Here is the results of running the spell checker in SharePoint. I spy with my little eye one misspelled word(s)! What a mess. All you want to do is insert a timestamp into a file name so as to make it easily organizable. That ought to be simple, right? The second issue is that the content of the DATE variable is inexplicably the result of the region and not independent of the region. So, if a user changes the date display according to where they are, if they change it from the default, the output of the DATE variable is different and must be parsed differently. (The same problem exists with the TIME variable and the 24 hour clock.) . Again, unfathomable why anyone would use this as a starting point. In short, I can’t offer a definitive line of code for giving a file name an up to the second timestamp. I can only offer a line that may or may not need to be tweaked for a given user. This slices up the DATE and TIME variables (using ~ and then some basic coordinates) to give a result (with an underscore between the date and the time). If the user is employing a different date (or time) format you’ll have to play around with the coordinates to grab the correct chunk. Best of luck. It seems that if I don’t have my phone angled just so, it will invisibly rotate my video. The rotation at the beginning of the film is what is used throughout, so if you think you have it horizontal and it turns out your first frame was vertical the entire film is then vertical. And you won’t realize this until you attempt playback. There are probably a million and one ways to fix the video rotation. Unfortunately none of those are built into the phone. I downloaded the video onto my laptop (running Ubuntu 16.04). Most of the advice I found was to use a program called Avidemux. I have used it in the past to change audio or video codices or move a video into a different container/wrapper (to mkv for example), and I have found it useful enough. However, it would appear that Avidemux is no longer present in the usual Ubuntu repositories as both apt and the Ubuntu Software Center did not find it. [aac @ 0x6cf380] The encoder ‘aac’ is experimental but experimental codecs are not enabled, add ‘-strict -2’ if you want to use it. Since my phone uses aac (apparently) I needed to add the -strict -2 in order to enable an experimental encoder. So metal! It worked great. The response offers some other rotation options, but of course the man page for ffmpeg is extensive. Here follow my testing notes concerning a problem which has arisen in the way file shares are being accessed from various Ubuntu client machines. I am listing behaviors for both the “Connect to Server” function (via Nautilus) and those involving the mount command (especially via the fstab file). Files and folders used to be accessible and they now are not. These notes will help determine the exact cutoff point for the failures, though sussing out those points could be exacerbated if there are multiple causes for the errors. The test scenario is as follows. There is an Ubuntu server (which happens to be running 10.04 though this is not critical at present). This Ubuntu server has multiple shares. Various files and folders within these shares contain (at least) two known effected characters: the colon (:) and the question mark (?). When those locations are mounted by mount (whether via fstab or no) using a 12.04 client machine the files and the folders which contain either (or both) of those characters in their respective paths are accessible as would be expected for any such file share. Below you will find testing results for Nautilus and mount (for each character tested) as well as version information for cifs-utils (used by mount). Finally, I am not a developer. I will be doing all the testing I am able and I will file the appropriate bug reports. I would also work with developers to perform any testing as might prove useful. ** 14.10 is out of service and thus I cannot download cifs-utils. And that is that. We shall see where this takes me. Thanks for reading. Feel free to experiment with other variables. This first configuration gives me day date month 24-hour:time. Importantly there are two kinds of pools in Horizon: automatic and manual. Automatic pools are pointed to a specific template and spawn new machines based on that template, and manual pools will accept the importation of, really, any viable virtual machine. But what if you find that you need to move a machine from one location into an automatic pool. There is no intended functionality for doing this. However, we are humans and we are clever. I will lay out for you the procedures I used. We have a domain and our machines are all domain joined. You may want to make adjustments for your specific situation, but the essentials here should guide you nicely. Before you begin, let your user know that there machine will be unavailable for half an hour to an hour and that you will want them to test access once you have made the changes. Remove the entitlement for that user from the machine and the pool. Remove the machine from the domain and shut it down. Delete the machine object from Active Directory. Use the Clone to Template function in vSphere to clone the machine to a safe template location. In Horizon, point the destination pool at your newly cloned template. Add a new machine to the automatic pool from the template you just cloned. Point the destination pool back to its preferred template. Power on the newly added virtual machine and add back to the domain. Entitle the user for the destination pool and newly cloned machine. It’s a bit of a hassle but it has worked dozens of times for me. Thank you for visiting my technology blog. Consider a donation if I was able to help you. If you were seeking my non-technology blog, you can find that here: The Ink Wells. Discover the Lost City of Seattle, Mexico!